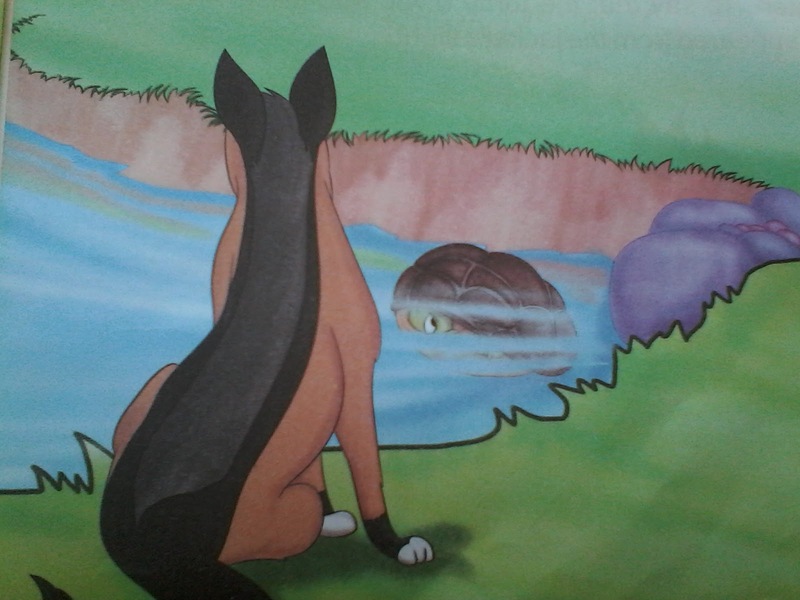 There lived a turtle in a pond. One day he thought to stroll the land. To think that he got out of pond, far that a jackal came after him. As the turtle saw jackal coming towards him he got anxious. The turtle thought that it was difficult to escape from the jackal at whatever speed he walked. On the other hand the jackal started to walk very fast to catch the turtle and then the jackal caught the turtle at a bit far distance. The turtle covers himself in a case in a dangerous situation. This case is hard enough. By doing so the turtle becomes safe from any harm. The jackal tried to eat the turtle but could not be successful due to the turtle's hard casing. 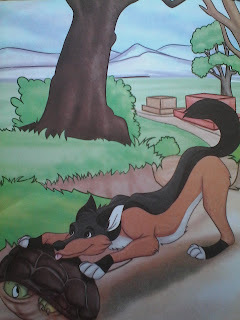 The turtle thought if the jackal inverted him he would easily eat him because the casing was only on his back. 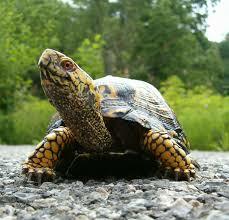 The turtle showed presence of mind and said to the jackal: Mr. jackal you cannot eat me as my skin is very hard. Put me in water and than you would easily eat me. The jackal tried to hunt turtle by putting his hands on the back of turtle but could not be successful. Now as he listened to the turtle he liked the turtle's suggestion. The jackal brought the turtle to the brink of pond by dragging him and left him in water. 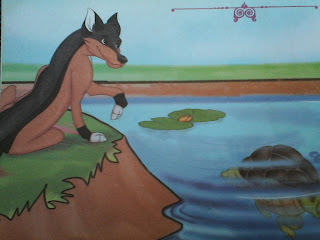 The turtle said to the jackal: it's very less water here. My whole body is not sinking in it. In this way my skin cannot be soft. I would have to go to the deep water to make my skin soft. The jackal said ; Alright, go in deep water and return after making your skin soft as I am very hungry at this time. The turtle went away in deep water by swimming. The jackal asked impatiently: How much time would it take to make your skin soft? Now I cannot bear my hunger. The turtle looked at jackal with smiling face and said: Now forget to hunt me as I would not come back on dry land whereas you would not catch me by coming in this deep water. To say that the turtle dived into deep water and disappeared from the jackal's sight.